We know you’re always on the lookout for fun kids party theme ideas, and Oh! you are going to LOVE this one… a Victorian Tea Party!! No, it doesn’t involve sending the kids out to work in the mines – it’s more of a cheery garden-party sort of thing with classic and pretty Victorian touches. Because we’re incredibly busy doing extremely important things, the party and decor are quick and easy to put together, and as with all of our kids party theme ideas it’s very affordable and makes the most of things you probably already have kicking about at home. We road-tested this Victorian party theme for Mads’ 7th birthday last year with a few of her little girlfriends, and you should have seen their eyes light up when they walked in the door! What I loved most, though, was that the decor and the little details completely transformed our house and made the girls feel like it was a really special event… in fact they still talk about it now, 18 months later. And unlike most kids parties, lots of adults decided to stick around and join us for a glass of Prosecco in the garden – always a nice bonus! 1) Borrow Victorian-looking items from the grandparents! We’re getting old, but we’re not THAT old, so most of us don’t have actual Victorian stuff around the house… but many of our parents have random old teacups, doilies, cake stands and tablecloths gathering dust somewhere in the house. We borrowed lots of bits and pieces from Nana, and found a few other items in the charity shops. The food was pretty standard garden party fare (quiche, sandwiches, cold cuts, fruit and fairy cakes), but Lein laid everything out on Nana’s old serving dishes and cake stands, the effect was just perfect. Notice how she also mixed and matched sweet and savoury and dotted berries around just as the Victorians would have done! Lein also found some pretty napkins, folded them into fans and tied them with a bit of ribbon to perfect the look. She also had some pretty little details in her sewing kit (you can get some at the haberdashery) so she stuck those on for a finishing touch. We made this homemade Welcome sign to hang outside on the front hedge instead of balloons! I say “we”… in fact I can take no credit at all. Lein looked up Victorian Fonts on Pinterest to come up with some ideas for the lettering and style of the welcome sign, and then she sketched it onto brown parcel paper. Mads then got to help by tracing the pencil in black marker. We’ve been to soooo many parties where the first kids to arrive either mill about, hang back awkwardly with their parents or get into mischief while they’re waiting for more kids. They absolutely need a focal point from the second they walk through the door, and in the ReallyKidFriendly house we’ve always found that a craft station works best. For our Victorian themed party, Lein set up a Decoupage station, using different shapes of boxes, glue, magazine clippings, old fashioned stickers, offcuts of fabric, wallpaper and wrapping paper. The kids got to choose a box and decorate it. Sooooo ridiculously simple, but they absolutely loved it… and they were delighted to take it home with them as their very own party favour instead of a plastic bag of cheap toys. For a 2 hour kids party, you’re going to need to have at least 3 or 4 party games up your sleeve. If you’re planning a Victorian themed party, the obvious contenders are Charades and Blind Man’s Bluff, but our favourites by far are Are You There, Moriarty and Squeak, Piggy Squeak. Clear some space somewhere with a clean floor, and choose two children to get the game started. They lie on the floor on their tummies with a few feet of space between them. Each is blindfolded and given a rolled up newspaper. Child 1 calls out “Are you there, Moriarty?”, and the other says “Yes” or “Here I am!”. Child 1 has to guess where the sound was coming from and tap Child 2 with the newspaper. Then it’s Child 2’s turn. If someone gets tapped with the newspaper, they’re Out and another child takes their place. The object is to try and stay in the game as long as possible by rolling or slithering away quickly after shouting “Yes”! It’s such a simple game, but absolutely hilarious (especially for the people watching) and the kids absolutely love it. If you’ve never tried this one, you absolutely have to have it in your repertoire! One child is going to be the Farmer, and the other children are piggies. The piggies sit in a circle, either on chairs or cross-legged on the floor. The Farmer stands blindfolded in the middle of the circle, and holds a cushion or pillow. When the game starts, the Farmer has to make his or her way over to one of the piggies, place the cushion on their lap, sit down on the cushion, and say “Squeak, Piggy, Squeak!”. When the piggy squeaks, the farmer has to try and guess from their voice which piggy he or she is sitting on. The cushion, by the way, is just to better hide the identity of the piggy – some have bonier little knees than others! If the farmer guesses the piggy’s identity, he / she and the piggy swap roles and the game starts again. The game works best when the piggies all swap places just before the Farmer chooses a piggy to sit on. Some of these games will have the kids in stitches and maybe a little too excited… so if you need to dial things down, you can also try a homemade version of Pin the Tail on the Donkey. At our party, we drew a donkey on some brown parcel paper, cut out a tail, and got the kids to stick it on with blue tac… which of course is so not Victorian but better than having tiny holes in the wall! 5) Get the timing right! Before you just throw a bunch of party games in the mix, think about the pace and the timing of the party. With young children, we’d recommend having the party early in the day so that the kids are on good form and so you’re not nibbling too much into your guests’ ‘family time’. Morning parties also mean that your guests’ parents will thank you for giving them time to have a coffee and read the paper in peace! 10:30 – Welcome the kids as they arrive and get them set up doing a craft activity. Remember, everyone will be arriving at slightly different times, so starting with a craft rather than a game means that the first to arrive have something to do and a chance to get themselves oriented. It also means that by the time you start the games, everyone will have arrived so nobody feels left out. 11:00 – Play a lively game. 11:20 – Play a quieter sit-down sort of game like Charades. 11:40 – Play another lively or outdoorsy game. 12:00 – Picnic or buffet style lunch. We lean towards cold, mess-free finger foods with lots of protein – it helps balance out all the sugar from the fairy cakes! 12:15 – Another lively game, but make sure it’s one without prizes or partners so that it’s not ruined when the parents start arriving. 12:30 – Time to send everyone home! We aren’t into party bags but always make sure the kids get a little party favour to take home – a cute cake pop in cellophane with a ribbon will make them happy as clams. For our Victorian Tea Party we sent them off with their Decoupage box and a few slices (some for mum & dad!) of Victoria Sponge Cake with strawberries. 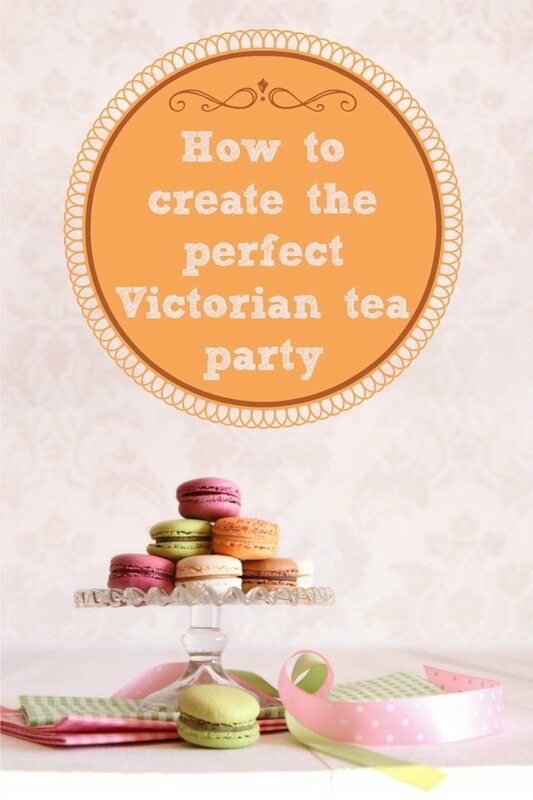 We hope you’ve got some great ideas to get you started with your Victorian tea party! Please feel free to pin Lein’s ideas to your summer party Pinterest boards! ReallyKidFriendly.com is an award nominated blog for parents that’s all about enjoying time with the kids! Founder Janis Curry is a mum of two boisterous kids (Mads & Danger Boy) and is also Head of Community for Kahoot!, a free game-based learning platform. All of our “make and do” and party themes are by Irish Artist (and Nanny!) Marjolein Wouters.